Sometimes things do not go as expected. A CO2 laser can suddenly stop working. The cause may be the laser head (resonator), radio frequency power supply, or DC power supplies. Sometimes the laser machine has a problem. Complicating matters further can be a lack of documentation, legacy systems, limited information available from the manufacturer and their motivation to sell new replacement products. And, if you're needing spare parts for the machine itself, we stock many parts. A laser engraver owner had a motor burn out in one axis. The original manufacturer no longer supplies this motor. Bell Laser is rebuilding the motor. A laser engraver owner was told a very high price for a replacement DC power supply for their 100 watt metal tube laser. Bell Laser supplied the replacement DC power supplies at a fraction of the cost. A high school with two non-working laser machines from a company in Nevada was given telephone support call pricing starting at $250. Bell Laser did not charge for the diagnostic evaluation, but did charge for replacement parts--at a competitive price. Laser machinery manufacturers can get out hand when it comes to replacement parts pricing. As a machinery owner and operator, you planned to make this investment work for you, and not you work for it. When you get quoted a price that seems outlandish, give us a call. Often, we have spares and can assist. Keep in mind that some manufacturers choose not to repair and require replacement--perhaps they lack the technical capability to repair or simply do not want to be bothered and it is more profitable for them to sell you new parts. Contact us for repairs that are affordable. 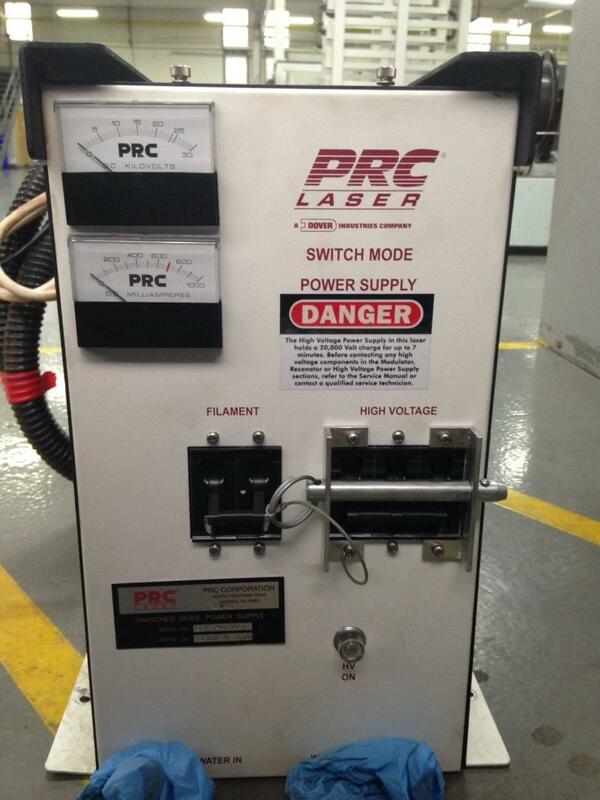 A complete list of your options, including: refurbished laser heads, power supplies, and more. Optional purchase of new equipment. Years of experience and know-how that are not provided in the manual. Immediate in-stock items to expedite your repair and get you up running as quickly as needed. A laser engraver owner with a Coherent GEM100 was given a high price for a laser refill then told 50% chance his laser could be refilled. The customer came to us for another opinion and a price quote. We refilled it for much less, no problems. A customer with a DEOS laser could not find the controller sold by the manufacturer (they stopped selling it). We had it in stock, and made up the cables at no charge. A customer with a Universal Laser Systems machine with a Synrad laser needed a refill. We refilled it, no problems and no hassles. A laser engraver customer was informed by the manufacturer that the lid pistons were no longer stocked, and told to go find it themselves. We had them made to size for the machine, for the price of a standard part. We sold a Xenetech laser with a refilled/refurbished 100 watt Synrad laser. The company that sold the machine to us originally had no laser output. By refilling the tube, we were able to create a high quality Xenetech laser again, and sell to a satisfied buyer for their new awards and engraving business. A customer with a laser machine (USA) problem contacted us for options. They had called in to the manufacturer and was told that they need to pay $3500 to speak to someone. We offered expertise and upgrade options. A Chinese laser owner contacted us about a problem--and his laser was not working (production down--big problem). Previously, he had contacted his China manufacturer (major player) directly, ordered a replacement part and the replacement went bad within 30 hours. We recognized this situation as one where the laser machine design/assembly/installation had a problem and that the customer would have difficulty getting a solution. We sold the replacement part at a higher-than-usual price in order to cover the online service/support needed to rectify the problem. We provided instructions to measure electrical grounds between all components and found a significant discrepancy. Advised the customer how to fix the problem. The customer had a person more familiar with electrical work come in and perform the work. After new measurements, the electrical problem was solved. As this foreign buyer reported, "And i do not stray electric current feeling in the frame of the machine as before. The earth ground between the differents elements (doors, frames etc) are done correctly, not before.﻿"
A USA laser machine customer contacted us regarding trouble-shooting of his Chinese laser machines (sold to him by a major USA seller that re-labeled them). He had been sold many spare parts and needed help on his problem. Recognizing his problem was software related and not a hardware issue, we proceeded to solve in this manner. Often, our stock includes refurbished and repaired items that carry a full warranty. Why pay premium prices from the machine manufacturer when your parts are available for much less? Our inventory includes refurbished and warrantied items including motors such as Pitman, Moog, and other servo motors correctly sized for legacy laser machines. We also have amplifier boards, belts, PCB boards including adapter boards and control boards, cables, limit switches, gears, rails, and more. Great parts for a brand name laser engraver owner that needs parts at a lower price, parts no longer available from the laser machine manufacturer, and people that are fixing/improving laser machinery. We recently repaired the lasers and optics for the 3D Systems Vanguard Si2 Scintering laser, and offered an upgrade (matching the OEM power offered) for one of several buyers. Sometimes, the parts are no longer manufacturered and not available on the market for sale. Bell Laser can find a solution. With years of experience designing and building laser machines, we understand the underlying reasons and technical factors in component selection. Armed with this understanding, we are able to replacement components and component sets with comparable products that are readily available on the market. For example, you have an manufacturer's "obsoleted" laser engraver and they no longer carry the spare part you need but only offer to sell you a new machine. Let's say the spare part is a motor. Bell Laser can provide that motor, or a different motor with comparable features so that you are up and running on your laser machine. We repair obsolete Synrad Fenix flyer laser markers. If you require new galvo motors or other parts, then contact us for repairs. We are now stocking repair parts for these Synrad CO2 laser marking systems that are considered obsolete and unrepairable by the manufacturer. Why pay for a new machine when the old one worked great?--get it fixed and back to original specs with our high quality repair service. Call today. Above: Synrad J series 48-5 CO2 laser powered at 50 watts. Ready for shipment. Above: Coherent DEOS RF laser power supply D600. Common failures include the internal DC power supply. We can repair or replace the DC power supply as required. We also have many spare parts in inventory. Gravograph (New Hermes and Vanguard) laser engravers have been sold for many years. Below is a sample of parts in inventory. Contact us for your spare parts needs. Above: Gravograph laser engraver DC power supply. Above: RF cable for Synrad T60 laser. Also, motors in stock with proper wiring connector for fast installation. Complete the form below for information about repair options or to move forward with immediate repairs.